Too Much Snow Too Early Tokyo Japan Snow In November – Coercion Code – "Dark Times are upon us"
Snow fell in Tokyo and elsewhere in eastern Japan on Thursday, the first snowfall to hit the Japanese capital in November in 54 years, disrupting traffic and causing electricity usage to spike due to heating demand. Injuries were also reported in Tokyo and surrounding prefectures, including people who slipped on snowy roads and suffered fractured bones, according to firefighters and other authorities. Freezing temperatures also caused snow to accumulate in Tokyo for the first time in November according to records going back to 1875. East Japan Railway Co. said services on parts of the Ome and Chuo lines were suspended as snow-laden tree branches sagged over the tracks. Trains on other lines, such as Seibu and Keio, as well as subway systems in Tokyo also experienced delays, operators said. On Thursday morning, electricity consumption spiked to 95 percent of capacity due to rising demand for heating, according to Tokyo Electric Power Company Holdings Inc. Temperatures in the capital and neighboring areas fell to near zero Thursday morning, a level rarely seen in late November. 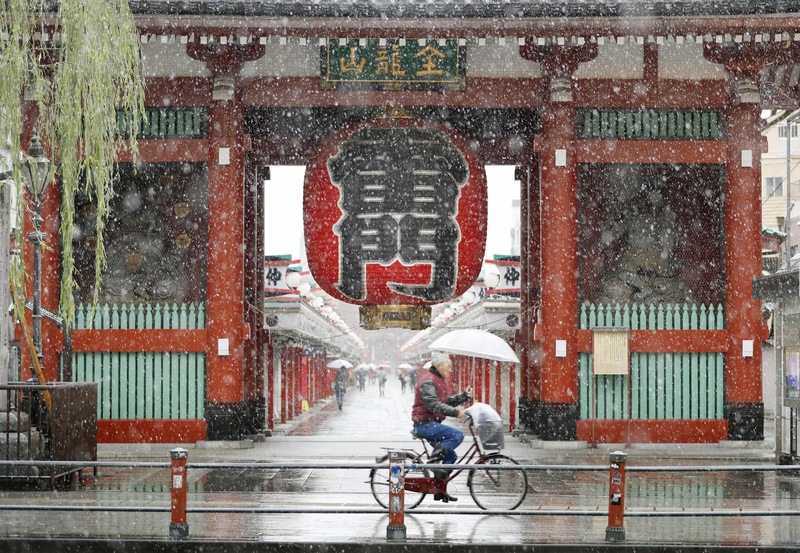 Snowfall began at 6:15 a.m. in central Tokyo, 40 days earlier than average. 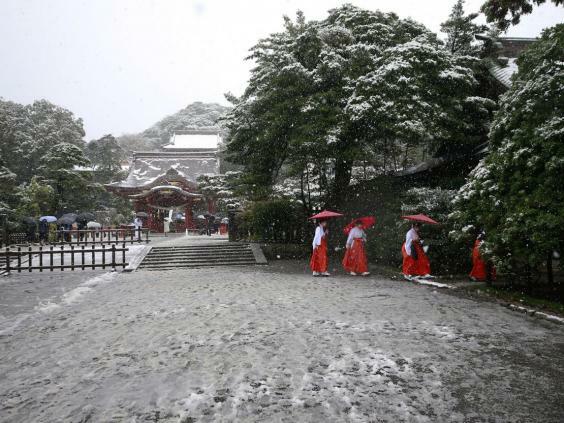 Other cities such as Yokohama and Utsunomiya also saw the season’s first snowfall around 20 to 40 days earlier than average. Temperatures dropped to a record low in many locations. In the town of Nakashibetsu, Hokkaido, the mercury hit minus 17.4 degrees Celsius while Tokyo’s Edogawa Ward recorded 0.8 C.
According to the Japan Meteorological Agency, a cold air mass with a temperature of minus 3 degrees at an altitude of around 1,500 meters was spreading over the Kanto region including Tokyo. Experts said the low temperatures and snowfall was due to Arctic air penetrating middle latitudes and being exposed to an atmospheric low with a front moving eastward off Japan’s Pacific coasts. The frigid air, otherwise kept locked in the polar region, has been released in the current phase of “Arctic oscillation,” a phenomenon characterized by symmetric seesawing between sea-level pressures in polar and middle latitudes, according to Weathernews Inc. The phenomenon has not been completely clarified, and it is unknown how long the current pattern will last, it said. The expected snowfall over a 24-hour period through noon Friday may reach 15 centimeters in Yamanashi and Nagano prefectures, 3 cm near mountains in northern Kanto and 2 cm in lowlands of the region, including most parts of Tokyo. Previous Previous post: Hillsong United Band Leader Calls Jen Hatmaker’s Remarks on Homosexuality ‘Refreshing’…….